Who Says Women Can’t Park? I’ll have you know that I passed my test first time, when I was 17. To be fair, having a 35 year old letchy driving instructor probably accelerated my learning – he asked me to marry him, used to park up so we could ‘chat’ (for ‘chat’ please read that he made massively inappropriate comments while I essentially looked a bit scared) offered to beat up my then boyfriend and was basically a dirty great perv! 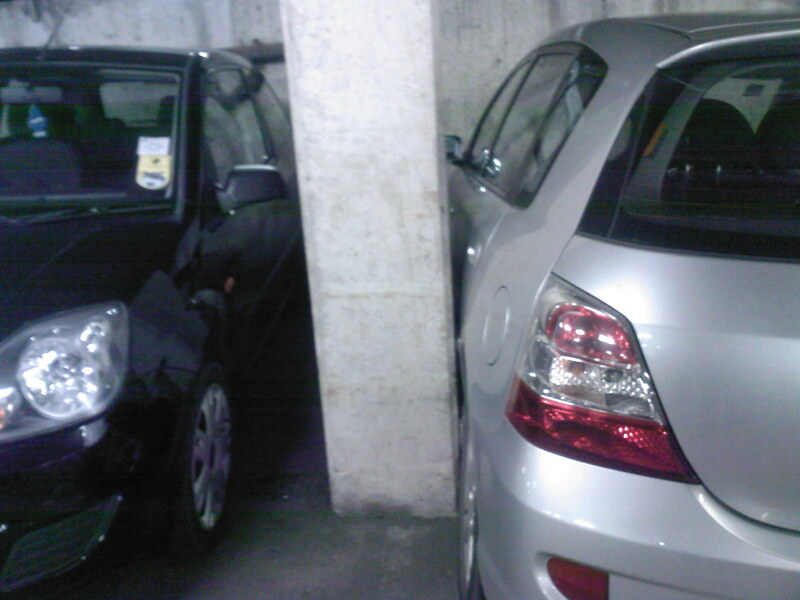 Yes, the car on the right is mine *hangs head in shame*, now don’t be thinking this proves that women can’t drive/park because what you should be focussing on here is the fact that I got the car out! OH was away so had no one to call and bail me out, so I took a quick photo and went to work – giggling. During the day I nipped out and bought a large pashmina. When it was time to face up the fact that I had to extract my car from the concrete post, I slipped the pashmina as far as I could between the car and the post, got into the car from the other side, undid the window and pulled the pashmina through a bit and then closed the window. Then got out and slid the pashmina further between the car and the post. Then, using more clutch control than I’d ever thought possible (it doesn’t look like it on the pic but the carpark slopes downwards) I gingerly eased the car out of the space. Then had to stop and remove the pashmina, still giggling, and surprised that no one clapped. I’d like to conclude this by saying the car wasn’t marked but to be fair it has a dirty great scratch down the side!